Updated iOS API and demo project are now available here. Previous post about iOS API. Note: make sure you are using latest firmware (v0.98) if you are working with OS X 10.11.
password protection is still not supported - if your InputStick is password protected, you must remove password protection to use it with iOS devices. "Mouse" screen - move mouse cursor with one finger, use two fingers to scroll. Three mouse buttons: left, middle, right. 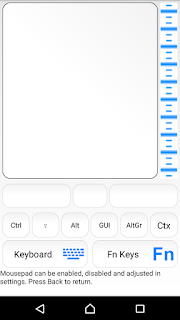 "Gamepad" screen - control gamepad X and Y axes and 4 buttons. v1.50 update will appear on Google Play within next few hours. Please let me know (in comments section) if you'll find a bug. Tab host can be moved to the bottom of the screen. 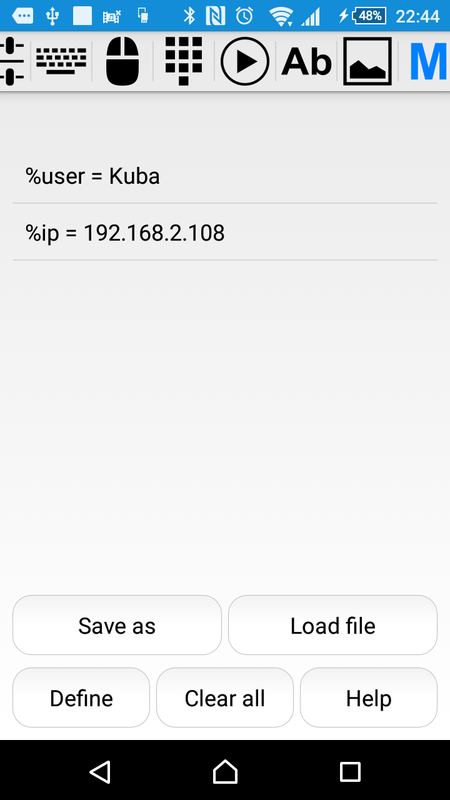 Compatibility with Android 6.0 permissions system - application will ask for permission to access internal storage (read/write files), when running on the latest version of Android OS. If denied, functionality of macros and voice commands will be limited. Important: it may be necessary to force stop the application after granting the permission: explanation and more details. long press or double click modifier key to press and release the key (for example: long press "GUI"button to press and release Windows key to open start menu). mousepad can be resized when soft keyboard is hidden. You can adjust this in settings. Modifier keys and mousepad in full-screen mode. Mousepad is resized when soft keyboard is hidden. buttons no longer take focus - enter and arrow keys now work properly all the time. 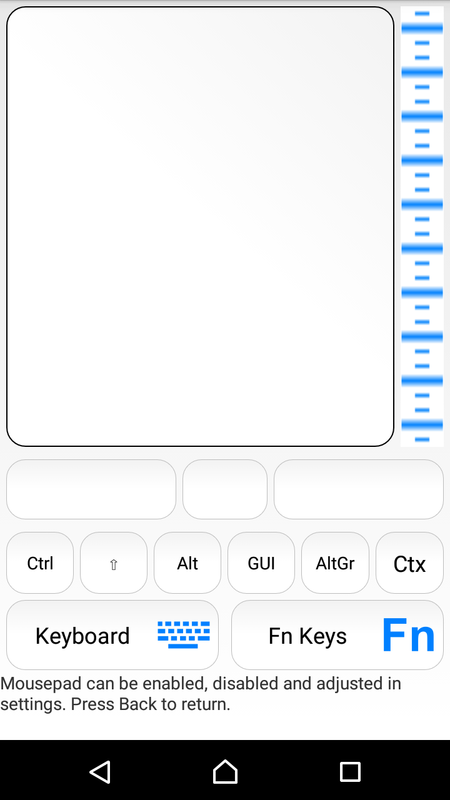 long press swap button ("blue arrows") key to go back to previous set of buttons. 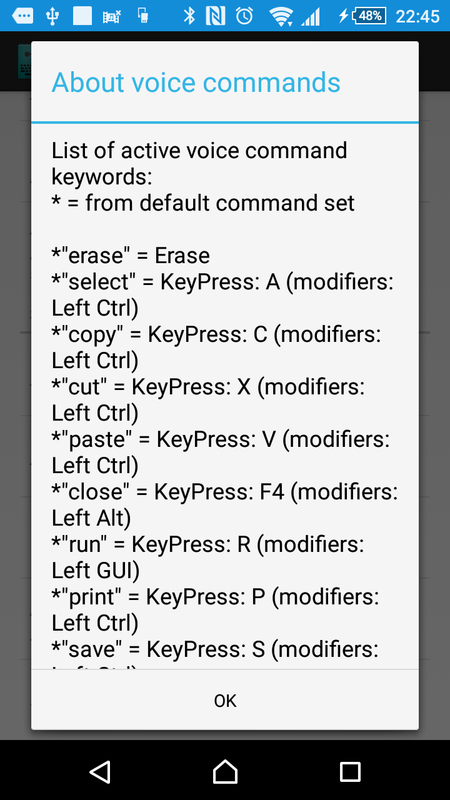 modifier key + non-modifier key combos now work properly in every mode (Settings -> Keyboard (Custom) -> Press and hold action). "Erase" button: removes last input by pressing backspace key the same number of times as there were characters in last input. Keeps track of the last input only! If pressed again (or there is no previous input), backspace key will be pressed only once. 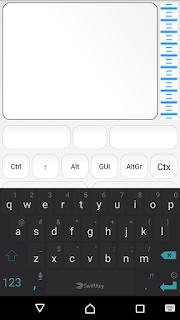 Example: if "some text" was types, "Erase" will result in pressing backspace key 9 times. Pressing "Erase" again will result in pressing backspace key once, no matter what text was typed before. "Real time" typing: text is types as soon as it is entered into text filed. 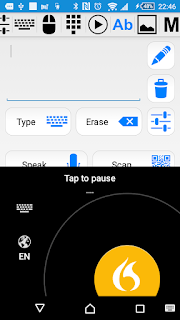 You can use features that are not available when "System keyboard" screen is used: swype, dictionary and text prediction, voice input. 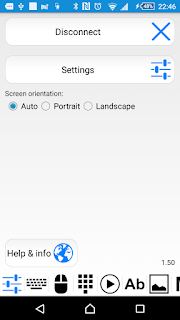 By default text stays in text field and must be removed manually (use "Clear" button). 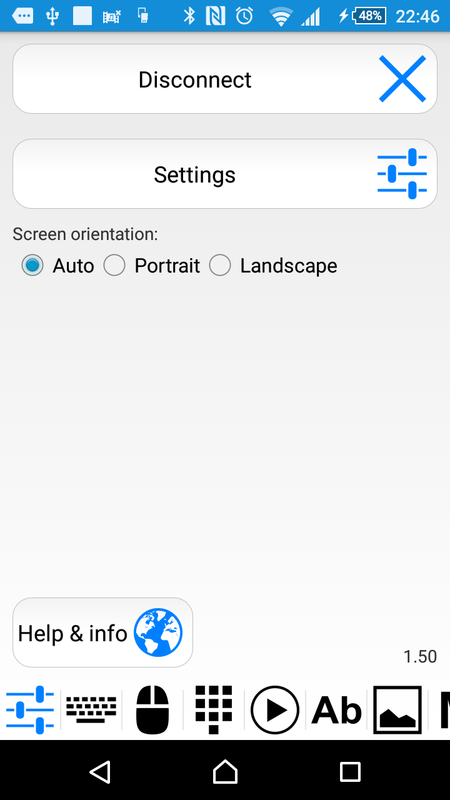 If you want the text to be automatically removed, see Settings -> Text -> Compatibility. 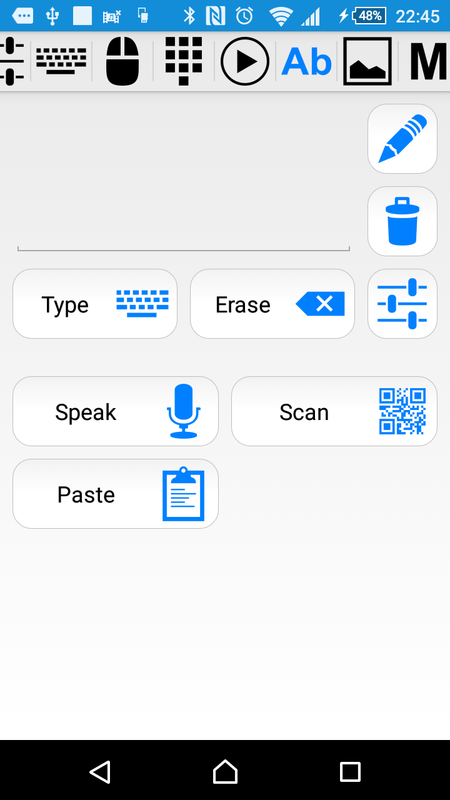 You can use "real time typing" mode for voice dictation in real time. 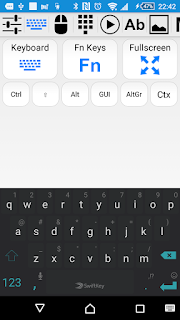 Use voice recognition functionality available in your soft keyboard. In most cases Internet access is required. 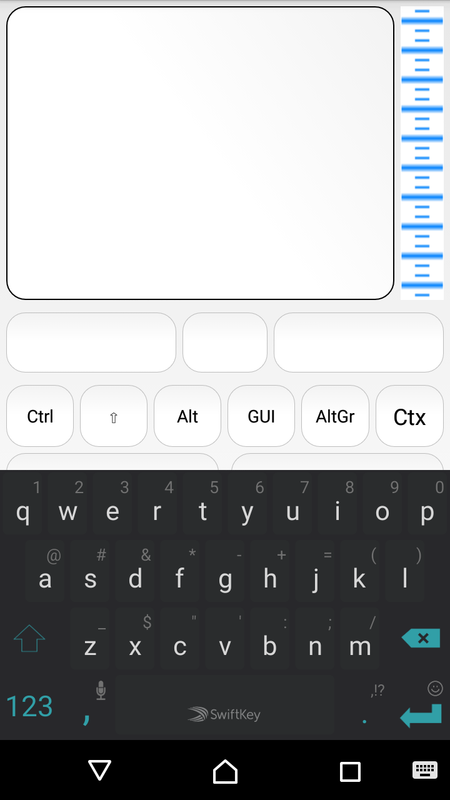 So far it looks like you can get best results using "Swype + Dragon keyboard". 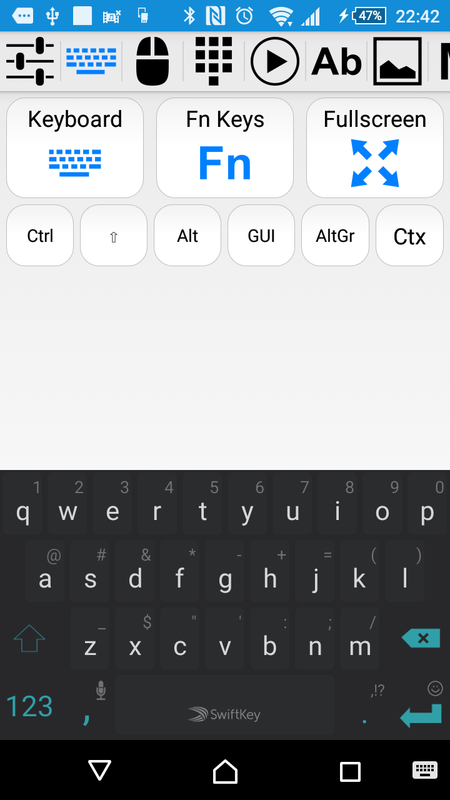 use Swype + Dragon keyboard (recommended), start voice recognition. as soon as it appears there, it is typed into USB host using InputStick. 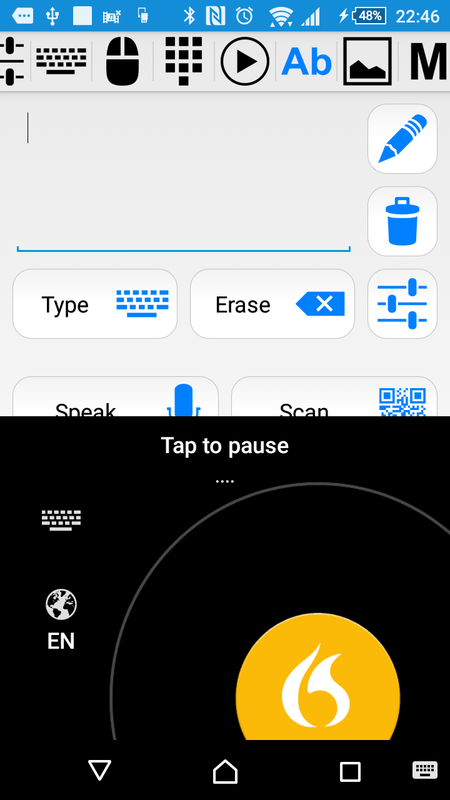 Voice dictation using Swype + Dragon keyboard. say "select" - Ctrl+A will be sent to USB host instead of typing "select". when you say "... select the file which ...", it will be typed as a text. when you say "... execute select ...." - Ctrl+a is pressed. Note: both words must be entered as a single input. So this will not work if you make a long pause between both words.Currently, activation keyword and command keywords must be a single word (no spaces, "my activation keyword" is not allowed etc.). You can see list of active command keywords in settings. 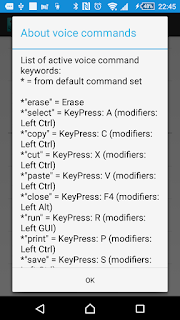 "erase" - removes last input (or presses backspace key). Same result as pressing "Erase" button. You can define custom set of command keywords, which can be added to the default set, or used to completely override it. 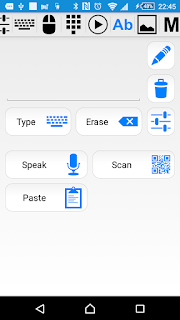 This allows to use non-English words or use words which are more easily recognized. Example: you can replace "paste" keyword with "wklej" (Polish language) or use "insert". 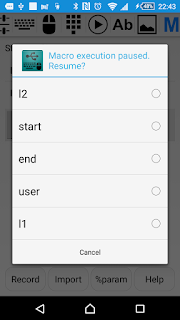 To use custom keywords, you must create file "commands.txt" and put it in USBRemote directory. Go to Settings->Text and choose if commands specified in this file will be added to the default set or will replace it entirely. By default, the file is ignored. Default macro storage location is now changed to file-system. 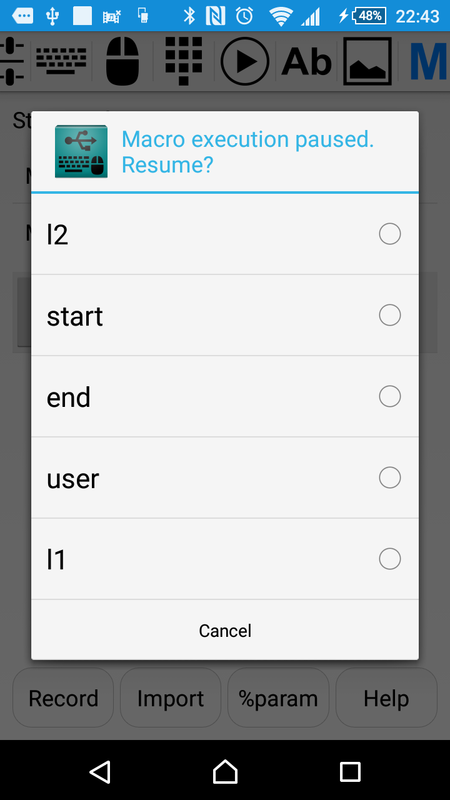 For now, it is still possible to use "Internal storage" option, however some new functions cannot be used in such case. comments: only for voice commands. action: declares that parameter with specified name can be used within this macro. Values of parameters will be substituted before executing the macro and must be specified using "Parameters" screen, <param> must be declared BEFORE it is used. #IMPORTANT: param must be defined before it is used! When <jump> instruction is reached, execution is paused and user is asked to choose at which point execution should be resumed. If canceled, execution is resumed at next instructions. <jump> instruction allows user to select at which instruction execution of the macro will be resumed. It is now possible to use parameters in macros (note: only if "file-system" is used for storing macros). Name of parameter must start with % character. Values are substituted before executing a macro. Parameters can be defined using "Parameters" screen ("Macro" tab -> %param). #always remember to define a parameter before using it! before executing the macro, %password will be replaced with either "1234" or "abcd". Warning: parameter files are not encrypted! Keep this in mind if you want to specify parameters containing passwords etc.